My stepmother is crazy about chocolate/orange, so over the years I’ve made a lot of desserts using that flavor combo. The only problem is sometimes the orange overpowers the chocolate and makes me wish I’d left it out completely. But that’s not the case here! 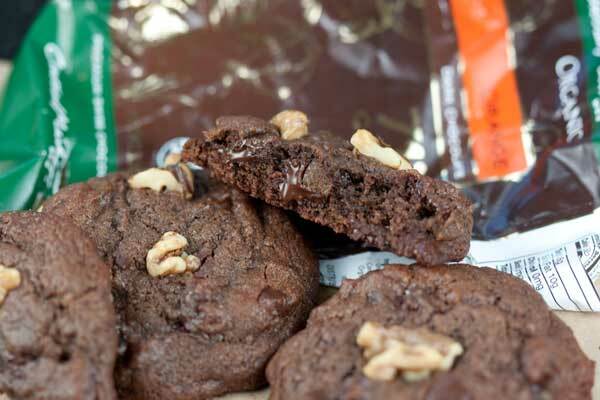 For Chocolate Orange Walnut Cookies, the dough is straight double chocolate and the orange flavor comes from flavored chocolate which adds just the right amount of orange. Of course if you’d rather have a good, soft, plain double chocolate cookie, you could use regular dark chocolate and forego the orange completely. The added honey or agave keeps the cookie soft and chewy and also adds a tiny note of flavor (but not much). The cookies here were made with a Central Market Dark Chocolate Orange bar, but Green & Black Maya Gold bar would be good too. 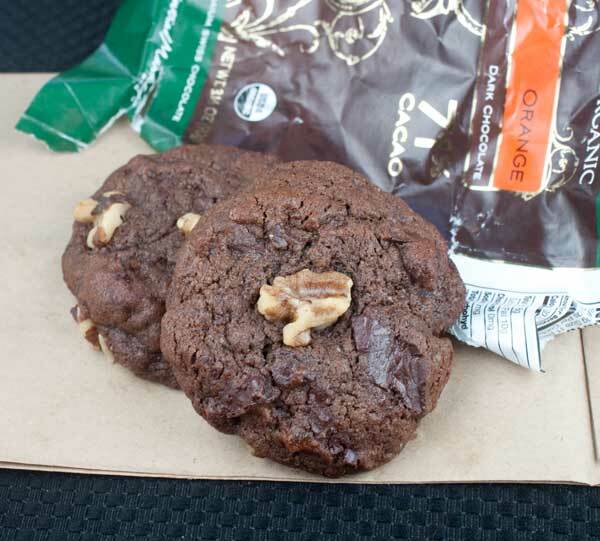 Chocolate Orange Walnut Cookies are double chocolate cookies made with orange flavored chocolate plus a little agave or honey to keep them soft. Stir together flour, cocoa powder, baking soda and salt; set aside. Using an electric mixer, beat butter until creamy. Add both sugars and beat until creamy; beat in agave (or honey) and vanilla extract. Add egg and beat just until mixed (or beat egg longer if you want a cakier cookie). Using a mixing spoon, stir in the flour mixture until incorporated, then stir in the chopped chocolate and nuts. Scoop dough into 16 to 18 balls and place on a parchment lined plate or baking sheet and let chill for about about an hour. Preheat oven to 350 degrees F. Line two baking sheets with foil or parchment paper. You can skip the chilling if you want, but cookies made with chilled balls of dough should be a little thicker. I adore this recipe only thing I changed was using dark chocolate and then adding grated zest and juice of 1 orange. I have a friend that will love these! One of my favorites that your step mom might also enjoy is an orange sugar cookie dipped in dark chocolate. When I can find it, I’ve also used orange flavored chocolate to dip cookies into which I really enjoy and doesn’t overpower the cookie. I love chocolate and orange too but I agree that you need to be careful with the orange. Next week I need to take a treat to a gathering. I might give these a try depending on what kind of orange flavored chocolate I can find. I love Theo orange flavored chocolate but I love it so much I won’t put it in cookies.